UN3373 is a DG shipment classification under IATA DGR -Infectious Substances. Infectious Substances are substances which are known or are reasonably expected to contain pathogens. Pathogens are defined as micro-organisms (including bacteria, viruses, parasites, fungi) and other agents such as prions, which can cause diseases in humans or animals. Infectious substances can be classified into two categories: A or B according to the level of infectiousness. There are a couple of different strategies we can take to keep students and teachers healthy during the school year. These strategies may include frequent hand washing, proper vaccination, and cleaning and disinfecting surfaces that are commonly touched by everyone. By staying healthy, you are staying productive and engaged throughout the school year. Can Floodwaters Put You At Risk For Infection? We all know how devastating hurricanes can be for a city. Flooding destroys homes and businesses, leaving people without jobs and places to live for days, even months, at a time. One of the most recent hurricanes, Hurricane Harvey, may cause more issues than structural damage to the people of Houston, Texas. To understand infection control, you have to understand the chain of infection and ways to disrupt this chain to protect yourself. Links of the chain include the microorganism, reservoir, portal of exit, mode of transmission, portal of entry, and susceptible host. In this presentation, ISSA Senior Training Specialist Mark Warner speaks about cleaning and disinfecting facilities for the upcoming school year and provides input on how to remain germ-free throughout the year. Warner explains that it is the school’s responsibility to thoroughly clean all appliances and utilities before kids return to school. Therefore, it is a mission of ISSA to help schools prepare during summer. At the same time, Warner notes that it is impossible to disinfect every single surface. And no matter how unblemished the building may be, “as soon as people start entering the building, they bring along with them anything they could be carrying on their skin or the soles of their shoes for that matter”. His advice? Be on your own guard. Wash your hands often and refrain from touching your face and scratching wounds in order to keep sickness away. Can There Be A Completely Sterile Environment? “You would think that a hospital is the most germ-free place, specifically designed for people to recover from illness, not catch them” but a recent study conducted by the US National Institutes of Health and the US Center for Disease Control and Prevention points to a different conclusion. The research study tracked 40 nurses who wore three types of scrubs (a traditional cotton-polyester blend; one treated with silver-alloy inside fibers; and one treated to kill bacteria) over three 12-hour shifts in which they monitored one or two patients in a medical or surgical intensive care unit. 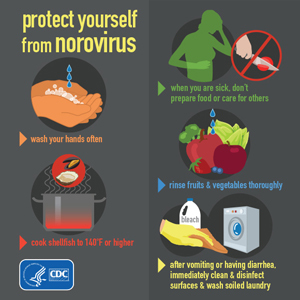 Norovirus is a group of viruses that are brought on when the food we eat or surfaces we touch are contaminated, lasting for about 1-3 days. Currently, there are six recognized norovirus genogroups. Three of the genogroups (GI, GII, and GIV) affect humans. In one facility, 59% of its residents tested positive for a bacterial infection. Yes, you read that right, more than half of the residents in a nursing home had an infection. A "significant presence" of multidrug-resistant bacteria, like E. coli, has been discovered among a quarter of nursing home residents, says a new study conducted by researchers at the Columbia University School of Nursing. Could You Be Doing More To Prevent Infections? In North Carolina a video was recently created and released that addresses physicians and health care providers in an effort to stop communicable disease and other infections. This rule is named NC Rule .0206 Infection Control in Healthcare Settings. If you are on the path of looking for a new supplier for your facilities disinfectant needs there are some considerations that you need to have. Your needs should be a good match for the solution that you will end up choosing. Your choice to switch could be to save some money in the budget, you are unhappy with your current disinfectant line, or you are just looking for a better product overall. Here are 5 things that you should consider when researching new disinfectant options.